Despite not feeling quite myself over the past week, (see last post), the garden has been unrelenting in its production of more and more tomatoes, beans and courgettes!! There were potatoes to be dug as well!! Consequently, the produce needed to be sorted out fairly quickly, otherwise I would have had too much to cope with if the harvesting and preservation fell behind!. I guess the bottling process distracts me from the shingles!! For many great ideas for surplus courgettes, see HERE .This is a great link with masses of ideas. I am, however, very thankful that my efforts over the growing season have been so well rewarded with loads of vegetables, over a spring and summer of very difficult and extreme weather conditions. Because I have only a small deep freeze, the easy "freezing" way out was not available to me, so I have been bottling more and more!! 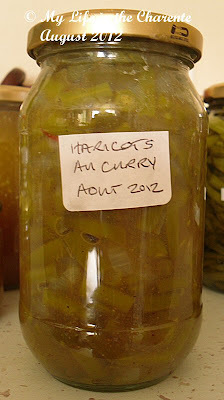 Thankfully, I had a good supply of jars, with plenty still in reserve for vegetables still to come. Because we have had carpenters in (lots of noise and another post), I have been making courgette cake (two kinds) as an accompaniment to their numerous cups of coffee. Both recipes were very popular and the suggestion was that while the courgettes last, they might just move in!! As the recipes are on my cookery site and I am feeling a bit lazy, I will give you the links for these recipes, so you can follow them there if they take your fancy. Back to the pickled beans ...... 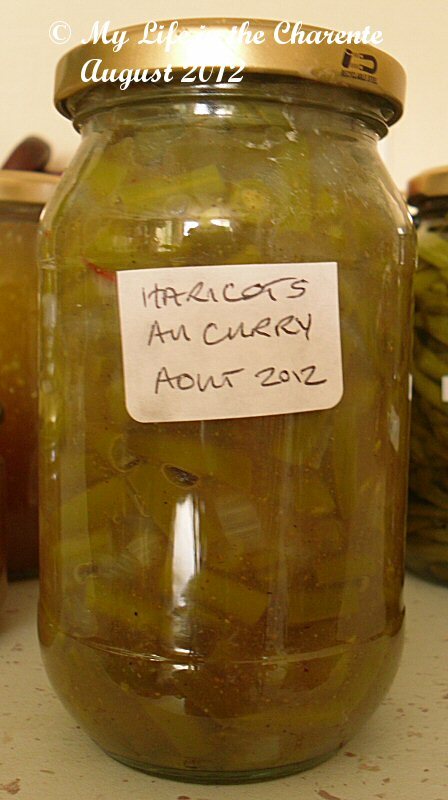 I brought the pickling liquid mixture, left from the courgettes, to the boil, and added the haricot beans, washed, top and tailed and cut in half. The mixture was then brought back to the boil and bottled immediately. In France, these beans are called haricots verts, but you would probably know them as French green beans. I experimented with this last year and the result, although I say it myself, was fantastic! The beans seem to shrink a little in the bottle, but when we came to eat them, I simply put the drained beans in fresh water and brought them to the boil. Drain and serve hot; they were delicious and slightly crunchy, just how we love them. You could probably just make up the pickle mixture for the beans alone, but I have always used it for the two recipes - courgettes and beans. I made these last year and we thoroughly enjoyed them last winter, so I made some more!!! 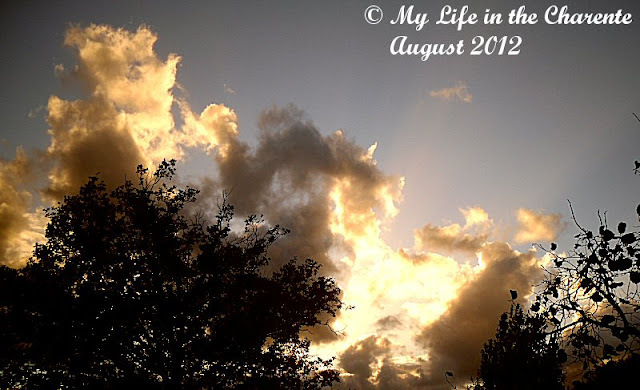 Finally, I just liked these clouds that were in front of the sun the other evening. The cakes look amazing Diane:) I hope you are feeling much better! You have a lot of unique recipes for using courgettes, most of these I have never heard about or seen before. You will have a lot of great meals this winter. Oh, I know what you mean about courgettes. My plants did nothing for months and have gone crazy in the last four or five weeks. I've made cakes, chutneys and cooked them in so many ways. 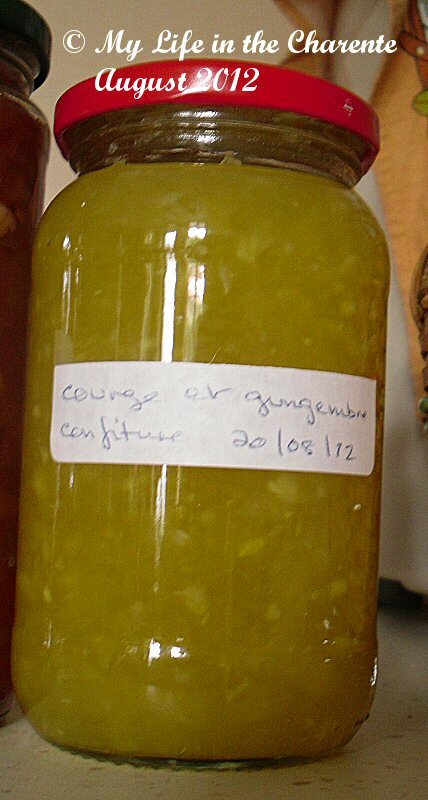 I haven't tried the courgette and ginger jam yet, but, if I can find the time, then that may be next. I hope you're feeling better or, at least, that you're on the way to feeling better. Great ideas for courgettes....I wish I'd known all of these while still in France. Here you can't get a decent courgette for love or money so, despite my memories or nightmares of courgettes seemingly advancing in hordes on my kitchen, I'm sending for seeds and growing my own again! i am canning tomorrow! not as much as you though! wonderful stuff!!! 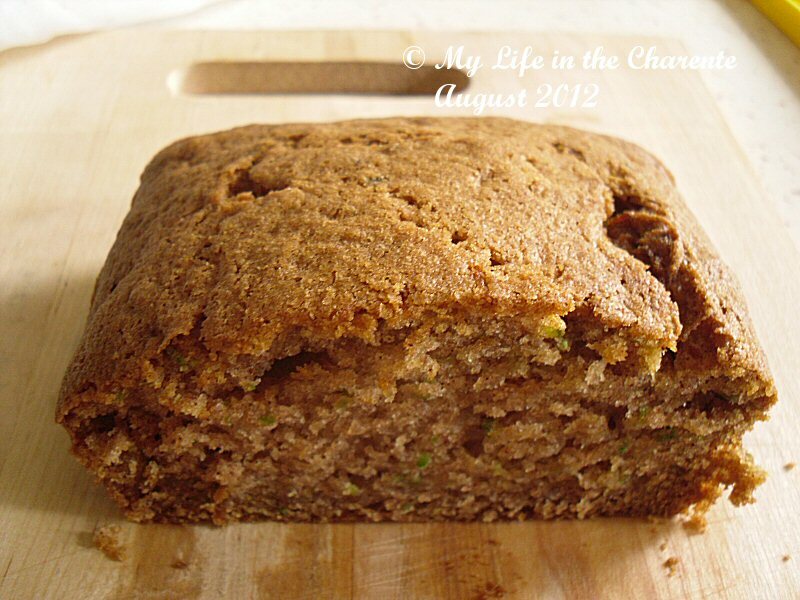 Well, I've made courgette bread and courgette cookies, so why not courgette cake? I'm sure your carpenters greatly appreciated your efforts. Glad you are on the mend. I LOVE pickled green beans! And those other chutneys look delish. So jealous of all your produce. Hope you are feeling a little better. Wow, you've got enough to last the winter season! I love your sky shot! I've been away and have missed following...sounds like you have been VERY busy! I'm sending my daughter the link to the chocolate version...her first garden in Oregon is FULL of zucchini (from a volunteer plant!). Hi Diane, good to see you back. Hope you've fully recover. Your cake look good, texture very moist. I think the lemon look delicious. Your pickled and courgette look awesome. Thanks for sharing your beautiful pictures. Have a nice day, warm regards to you. I like the idea of the cakes. They look moist and delicious! So glad to hear you are feeling better. I've thought of you often. Looks like you are going to enjoy a lot of vegetables this winter. golly i envy your stamina and ability to grow and pickle your own veggies especially when you are sick. I'm going to check out the lemon cake as we have plenty f those growing. The pickled beans sound delicious. not sure what a courgette is. Is it what we call a Zucchini? I must have been half asleep when I made this comment. The punctuation and grammar makes me squirm and then not noticing that you had Zucchini in the title. Sounds like we have lemon cakes growing when I meant lemons. I am glad that you are at least well enough to have done a tremendous amount of work. There was a time when I did all this too, but I've grown lazy in my old age. Besides, there were few vegetables in the garden this year, what with all the rain and the lack of sun. What a fantastic store cupboard you must have! Goodness me you have had a successful season with the vegetables and as you say all the work is taking your mind off the shingles. I do hope you feel better soon, you seem to have had a rough time health wise recently. I do hope that you return to good health soon Diane. Glad to here that you have had such a bountiful harvest from your garden. All of your ideas sure look yummy. Will have to look at your cake recipes. Have a great week and get better soon. Even with your heat, it is wonderful that you have had an abundant crop. So glad that you added the last photo...just beautiful. So many great ideas for zucchini overload. I used to take the giants and seed and puree them and freeze it and use it like pumpkin! It made a tasty pie! lostpastremembered now if only I had deep freeze space that would make my life so easy!! Diane! I've never tried these cakes and they look delicious! Hi Diane .. it sounds like the carpenters love your cakes ... but the produce from the garden is just amazing. I'd love to learn to bottle veggies - perhaps next year ... However it sounds like trying to keep up with nature is doing you some good and as you say taking your mind off those dreaded shingles ... I hope that eases sometime relatively soon .. Your chocolate cake look so good, and like to see how you enjoy in winter with all these pickles . You have done really well with your garden produce this year. I hope you are feeling a lot better now -it certainly hasn't stopped you from being busy. yum! Love that last picture! 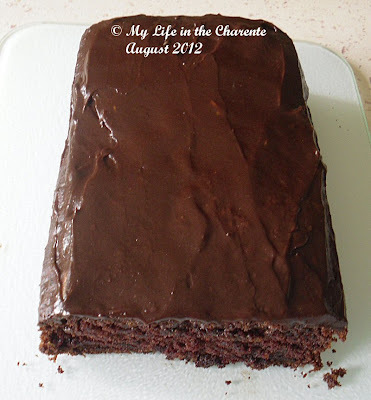 I know zucchini are versatile but I've never tried making a chocolate cake with them! Hope you are feeling better. 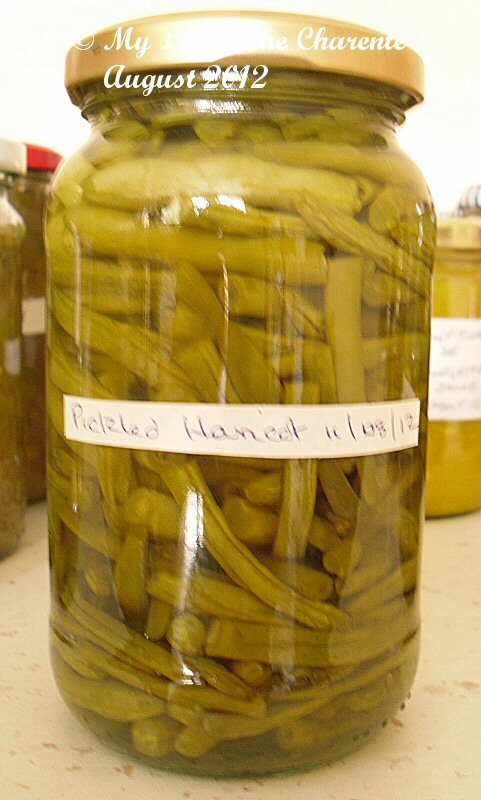 the pickled beans sounds like something nice to eat and your courgette cakes look beautiful too! i guess you are in a better mood now that you are baking for the carpentars! keep well, diane! lena the pickled beans are very yummy as are the cakes. 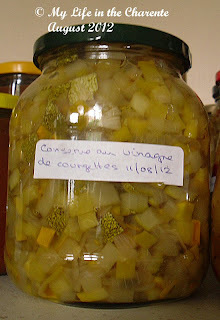 Cooking extra for the carpenters was easy and a good way to reduce the number of courgettes!! I never knew that courgettes are so veristile! It is fortunate you are so busy with conserve bottling and recipes! This is great diversion from the shingles, Diane! Everything looks great and I can see why the workers want to move in, to have a good supply of cake! I do hope you are feeling better now! I just learned this morning that my daughter-in-law has the shingles, around her waist. She's only 32! Take care and have a good weekend! Looks like you have put the spare courgettes to great use, particularly in that cake..it looks delicious! I must try the combination with chocolate I've heard a lot about it. Just wishing you a great weekend! Wow You do so many things with your courgette. The courgette lemon cake sounds good. I would love to have a piece. Wow! So many great things to do with zucchini... YUM! The cloud photo is beautiful. These cakes look delicious andi admire you for bottling your vegetables . Nothing to waste, great job. What wonderful recipes. I am always trying to do different things with my zucchini. It comes in so fast, I am afraid of losing it..in winter, I am so proud of saving it all..in many different ways. Thank you for your recipes, they sound wonderful..will have to try them. Hope you are feeling much better..know you are in my thoughts..
me too I am tempted by having a try at the courgette lemon..
chocolate and courgette just do not seem to marry well to me, but that might be my 'belgium'ness , ha ha ! Quelle chance d'avoir un jardin aussi riche. Plein de produits gourmands pour l'hiver. Un gâteau plein de saveurs qui me plait beaucoup. Diane, you have been busy, even though you are under the weather !! Our courgette seeds did not germinate this year, even in the greenhouse, the spring was so cold, so I am envious of your harvest. What a lot of delicious food. You make me hungry with this all. I think the Lemon Cake will be tast very well with a cup of cappuccino,..hhmmmm...!! Very nice to make this all. Hello Diane. I haven't had time to post on my Paris blog, but felt like coming to you for my little France fix. Since I last visited you've been busy - having a birthday, feeling unwell, planting, harvesting and bottling. Go!! Those pictures made me drool. I hope it all tastes as good as it looks! Looks like you've been a busy bee keeping up with all those zucchini and green beans! I made your Courgette Lemon Cake this afternoon - Oh my, dear Diane, oh my. I've already had 2 slices for dessert! I am waiting for spring now, I want courgettes too! Glad you're at least getting well to post something. I enjoy pickling but have yet tried pickling beans so far. Thanks for sharing it. Hope everything went well on your side.